0	0	Red Letter Christianity	In Stock - Order before 2pm for same day dispatchWant it on Wednesday 24 April? 'Red Letter Christianity' gives you the thoughts of two revolutionary authors who both believe the 'red letter words' spoken by Jesus are more than just letters of a different shade, they literally contain everything we need to know, believe and live by. 'Red Letter Christianity' is a both encouraging and challenging read that will awaken you to Jesus' call to live a revolutionary life. Shaine Claiborne (author of 'The Irresistible Revolution' and circus enthusiast) and Tony Campolo (author of 'Let Me Tell You A Story') are both red letter Christians. Meaning: they take Jesus seriously by endeavoring to live out His radical, counter-cultural teachings as set forth in Scripture, and especially embracing the lifestyle prescribed in the Sermon on the Mount. The pair toured the UK in August 2012, stopping in Birkenhead, Southampton and Belfast, to promote the book and their message, with Rend Collective tagging along to lead worship. Confronting today's most pressing issues - such as consumerism, the gap between the rich and the poor and the environment - is not the responsibility of our government, it's something Jesus commands. These red letter should keep us up at night. Red Letter Christianity by Shane Claiborne; Tony Campolo was published by Hodder & Stoughton in September 2012 and is our 15076th best seller. The ISBN for Red Letter Christianity is 9781444745382. The title refers to the fact that some of the early counter-cultural evangelicals such as Tony Campolo, one of the authors of this book, called themselves ‘red letter Christians’ based on the words of Christ being printed in red in many bibles, thus highlighting the radical words and actions of Christ that they were founding their lives and faith on. This book is a discussion between one of these founding red letter Christians and one of the leading names in the new breed of red letter Christians - Shane Claibourne. As Campolo says in the introduction, though the theology they share is fundamentally the same, the way in which the newer generation and the older generation do it is really quite different and this book is a way of looking at these differences, of weighing and considering them and seeing where they differ, how they differ and why they differ. It addresses, in the form of a discussion between the two, issues divided under three 'red letter' headings, namely Theology, Living and World. In theology we hear them talk about issues such as history, community, liturgy, Islam, economics etc. In living they address pro-life, environmentalism, homosexuality, immigration and giving amongst others, and finally in World they look at politics, national debt, middle east, mission and resurrection to name a few. Through the discussions you get a real feel for the authors, their personalities, outlooks and opinions. It’s a very clever move to have two different fonts so that you know easily who's speaking and in a way you can more easily hear their 'voice' and keep track of where you are in the discussion between the two. It is a fantastic book to read as it covers a plethora of subjects, but not only that it is almost like a first primer of red letter Christianity - what it is and how you do it, what underpins it and what structures and insights it has to give. Not a catechism but nonetheless a strong guide to understanding how to go about 'living the words of Jesus no matter the cost' from the viewpoint of two articulate and respected proponents of the movement. It would be great to use this in a group setting, using each chapter as an opening for discussion and debate - I think they would be incredibly lively group sessions indeed! Take a peek at some articles related to Red Letter Christianity. Jesus said a lot of challenging things  about loving our enemies, our attitude to the poor, and the way we speak about others. But how seriously do we really take his words? What if Jesus really meant what he said? And what if doing what he told us really made a difference  to the whole world? Red Letter Christianity explores the crucial issues facing followers of Jesus today, including global poverty and injustice, the growth of the church, sexuality, the environment  and many more. Shane Claiborne is the bestselling author of The Irresistible Revolution and Jesus for President. He is a founding partner of The Simple Way, a faith community in inner city Philadelphia. Acclaimed preacher Tony Campolo is Professor Emeritus of Sociology at Eastern University in Pennsylvania, and was a spiritual adviser to Bill Clinton. He is the author of Letters to a Young Evangelical, Speaking My Mind and Which Jesus? Red Letter Christianity will challenge you to take literally the words of Jesus printed red in the four gospels. Two authors show how the words spoken by Jesus, his life, death and resurrection are about restoration not retribution. Their Red Letter approach to Christianity honours Jesus by living out his radical, teaching through the counter-cultural lifestyle described in his sermon on the mount. "Jesus did not mince words and neither do Shane and Tony. The Good News of the Gospels is that Jesus guides us with lessons that are abundantly clear; there are no ambiguities, no rationalization of war, oppression, wealth, or of the disgraceful economic divide that threatens to consume us. In Red Letter Revolution, the uncompromised truth of Jesus' teachings are given voice by two modern-day Christian leaders who do more than preach this Good News. They walk the talk and lead the way." - Archbishop Desmond Tutu. "The conversation between Shane Claiborne and Tony Campolo, well known for their clear evangelical witness on the front lines of poverty, justice, discrimination, and economics in America, is a generous invitation to us to join their conversation as they take the words of Jesus serious, literally, and obediently. Red Letter Revolution is an adrenaline-producing conversation with prophetic bite." - Eugene H. Peterson, Professor Emeritus of Spiritual Theology, Regent College and author of The Message Bible. "Shane and Tony? Talking freely and honestly about almost everything under the sun-telling stories, quoting stats, giving insights? Seriously? Now that's a book I'd give my friends..." - Rob Bell, author of Love Wins and Velvet Elvis. "Few people have touched the conscience of the church - or that of myself and my own family - like Tony Campolo and Shane Claiborne. But the passion that flows through them that matters most is the passion of Jesus for so many on the margins of life who are urgently loved by the One who - though He was rich - yet He became poor for our sakes. I am grateful for their work and thought and lives. May the words of Jesus grip the world once more with the urgent conviction of impatient love." - John Ortberg, author, speaker, and senior pastor of Menlo Park Presbyterian Church. "Muslims revere Jesus as a messenger of God. 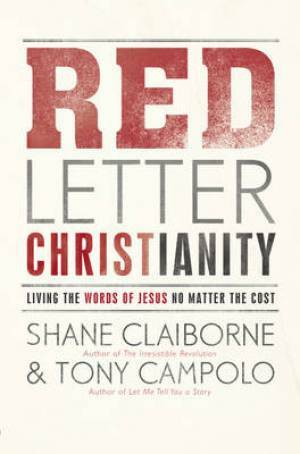 In Red Letter Revolution, Shane Claiborne and Tony Campolo demonstrate how Jesus' words and example apply to our broken world today. Claiborne and Campolo remind us that Jesus was the champion of the poor, the despised, and the outcast, rather than the powerful or the wealthy. Muslims have a deep respect for Jesus, and we know the world would be a better place if Christians took his words seriously. This book does just that." - Sami Rasouli, Muslim Peacemaker Teams, Najaf, Iraq. "Red Letter Revolution will challenge you and launch you into our world as an agent of transformation, a pursuer of justice, a lover of people, and an all-out follower of Jesus." - Rev. Oreon Trickey, associate pastor of Congregational Life, LaSalle Street Church, Chicago. So What is a 'Red Letter' Christian?